The Chicano Latino Research Center kicks off film series November 8. 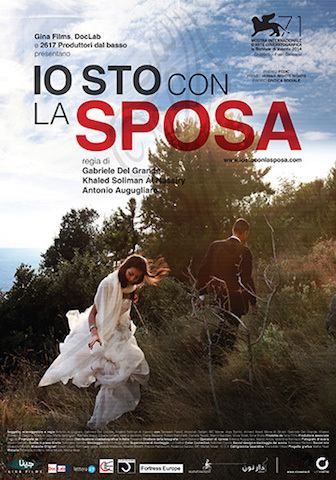 Crossings Film Series presents a screening of "Io sto con la sposa" ("On the Bride's Side") on November 8 at 5:30–7:30pm at UC Santa Cruz in Humanities 2, Room 259. 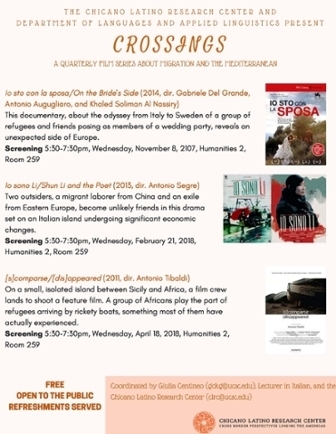 The Chicano Latino Research Center (CLRC) and the Department of Languages and Applied Linguistics are hosting a quarterly film series about migration and the Mediterranean. The Crossing Film Series will screen three films–one documentary and two dramas–over the 2017-18 school year. Each film depicts the diversity of the migrant experience in a globalized world. “The films in Crossings remind us that the U.S. is by no means the only nation of immigrants,” says CLRC director Catherine Ramírez. “They testify to the multiple motives, including desperation, chutzpah, and hope, that compel migrants to leave the known for the unknown,” she adds. The series will open on November 8 with Io sto con la sposa (On the Bride's Side). Directed by Gabriele Del Grande, Antonio Augugliaro, and Khaled Soliman Al Nassiry, this award-winning documentary follows a group of Syrian civil war refugees and their friends who pose as a wedding party in order to travel from Italy into Sweden. In Milan, a group of migrants, including five refugees of the Syrian civil war and survivors of one of the 2013 migrant shipwrecks near Lampedusa, meet and plan their move to Sweden. With a Palestinian friend dressed up as a bride and more than a dozen Italian and Syrian friends as wedding guests, the group crosses Europe on a four-day journey of almost two thousand miles. Their emotionally charged odyssey not only brings out the stories, hopes, and dreams of the five refugees and their new friends, but also reveals a transnational and supportive Europe that opposes the restrictive laws that are meant to keep refugees out. The following films in the series will be Io sono Li/Shun Li and the Poet (2013, dir. Antonio Segre) on Feb. 21, 2018 and [s]comparse/[dis]appeared (2011, dir. Antonio Tibaldi) on Apr. 18, 2018. All films are subtitled and will be screened in Humanities 2, Room 259. The events are free and open to the public.